Jordan tells her they have until Friday for Nominations. Sarah isn’t going to bother bugging Bruno tonight but she wants Jordan to feel him out a bit so there’s a glimmer of hope. They talk about how Bobby was helping people during the HOH competition. Jordan – normally you can’t do that. Sarah saying Graig going home had nothing to do with her She feels that Bruno is going to put her up. Bobby isn’t sure reminds her that Bruno is his own player. Sarah says she’s going to leave Bruno alone tonight but talk to him tomorrow. Bruno – I got you too.. no stress. 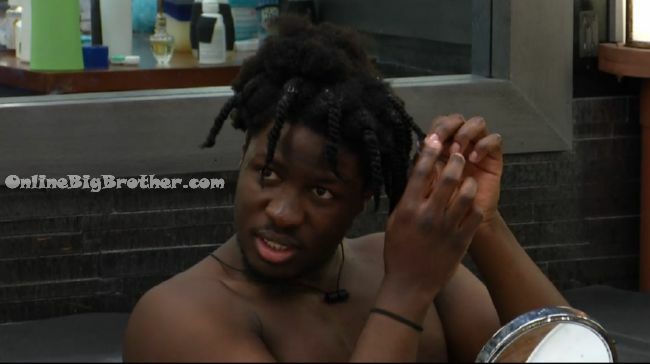 Bobby telling Godfrey he’s talked to Bruno they are good. Bruno says he got three letters, 2 from Bobby and 1 from Godfrey. Zach also got a letter from Godfrey. Bruno is putting Johnny and Sarah up and he would rather not put Kevin up. He was thinking about putting Pilar up as a pawn but he’s not thinking about doing that anymore. Bruno says it’s win win Sarah or Johnny will go this week. They agree if Johnny would have won HOH it was going to be one of the boys going home. Bruno says it would have been himself, Zach or Bobby. They comment on how much Johnny is going to battle for the POV. They want to win it so they can keep the nominations the same. Bobby comes in warns them Brittnee might be coming up. Bobby says Sarah leaving would be a waste she’s not good at comps at all and her social game is lacking. Zach and Bruno point out that she can get into people’s head look at what happened with Brittnee last week. Zach says those three might have a couple stragglers like Pilar and Kevin. Adds they might think they have 7 people but they really only have 3. Bobby is worried that Kevin is coming after him. Zach warns that Bobby’s Speech was a little much. Zach tells them getting Johnny out this week is the better play. Bobby agrees. Brittnee saying she only trusts Sarah. Sarah feels the same way. Brittnee – if you go up there I will do everything in my power to get you off..
Sarah wants Brittnee to sit with Brino and see how he’s acting..
Zach comes in. . starts coaching her on what to tell Bruno. Tells her to make Bruno know Sarah is only with Britnee. Zach says he talked to Bruno and he told him he hadn’t figured out who his target is yet. Zach is worried because Bruno is a smart player he might go after a big target like him. Zach leaves Sarah tells him he’s the best..
Sarah – so h’es not putting Bobby up, he’s not putting Godfrey up.. They think if it’s them up against Johnny they will stay and Johnny will be voted out. 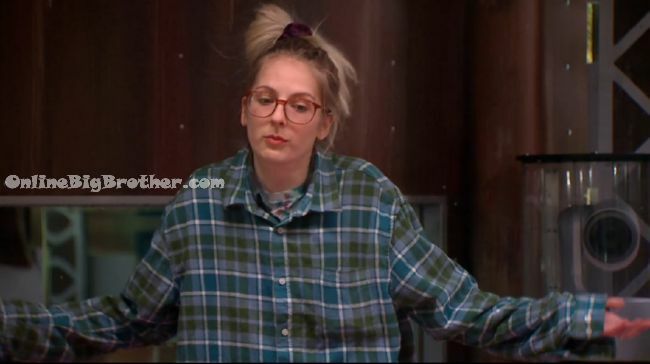 Sarah – I tried.. then I tried helping Zach..
Sarah proposes they all go up to the HOH and tell Bruno if he puts them up they area ll coming after him. These people are all dumb. This is going to be another year like the last two. Showmance makes it until the end and they bring someone that would never win anything. I wish people would be smart and get rid of the couples. In season one Jillian and Gary were the final 2 and they were not in a relationship and were both very strong competitors. In season 2 Jon and Sabrina were in the final 2 and yes she was not a good competitor physically but they were not in a relationship either. So how do showmances always make it to the end?? Well technically BOTH couples DID make it to the end. BOTH lasted until finale day. BOTH evicted came in 3rd place by being cut by their partner This wouldn’t have happened had the power couples been broken up. Jillian and Emmett made it to the end. Jon and Neda made it to the end. 1st, 2nd, 3rd, doesn’t matter. They were all in competition for the finals. 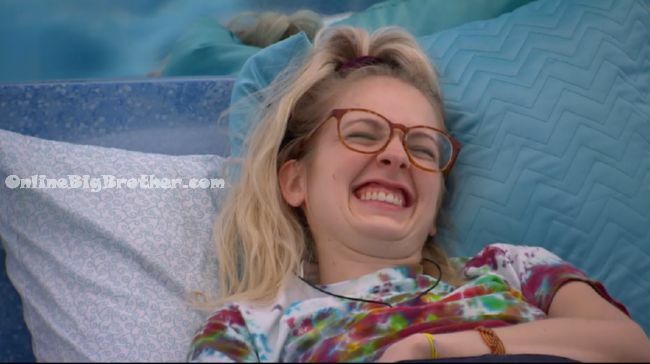 Lol poor willow… no shot at winning, no shot with Zach, no shot in life….. So Bruno got two letters from Bobby and one from Godfrey to help him win. Is that allowed? Has it always been that way? From the sounds of it a lot of people were helping each other out but Bruno benefited from it first. No – this is the first year BBCAN G_ds have let the HG’s get away with cheating. combine that with all the constant talk about production and the destructive uncaring nature of many of them, these HG’s need a rude awakening. Im peeved at all the blatant disregard for the rules, production and the game as a whole.